This bronze work is characterized by a dark green patina; the ungainly form is partly to put down to the work of the restorer who repaired the third finger, the longest one, the edges of which were damaged. As a whole, the shape of the foot appears particularly heavy at the instep. This bronze was mentioned for the first time by Albertini. This bronze was originally placed in the porch, but Ulisse Aldrovandi states that he saw it on display inside the palace. Later inventories report that it was moved into the Sala delle oche (1687), then into the Stanza dell’Ercole (1692) and finally brought into the hall of the bronzes (1876). 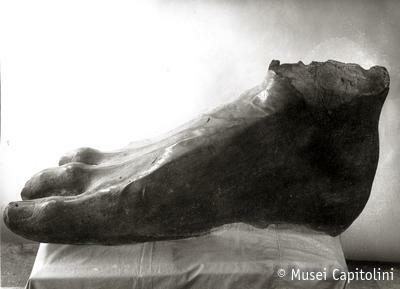 It was incorrectly believed that this foot belonged to a statue placed near the Piramide Cestia. The foot, which was probably found in Rome, is perhaps part of the first group of bronze sculptures that were moved from the Lateran to the Capitol at the behest of Sixtus IV in the 15th century.